Click on the photograph to go back to spider on concrete patio. 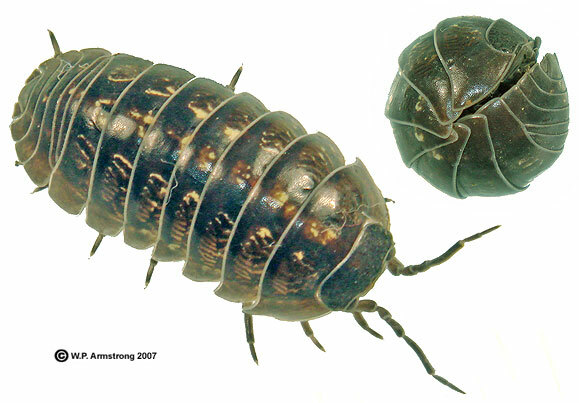 A common pillbug (Armadillidium vulgare), one of the favorite foods of the sow bug killer spider (Dysdera crocota). The common name "pillbug" comes from its ability to roll up into a ball resembling a pill. This ability to roll its articulated body into a ball is also the derivation of its generic name Armadillidium because of its superficial resemblance to an armadillo. Its specific epithet vulgare refers to its common occurence. Actually vulgare is derived from the Latin "vulgaris" in reference to common. Although vulgar is also derived from "vulgaris," it has other meanings in the English language, including ignorant behavior that is obscene or indecent. These latter meanings generally do not apply to pillbugs. The true sow bug (Porcellio laevis), another common crustacean that inhabits moist flower beds of southern California, cannot roll its body into a ball. Both species belong to the order Isopoda in the large arthropod class Crustacea. They feed on young and decaying plant material. 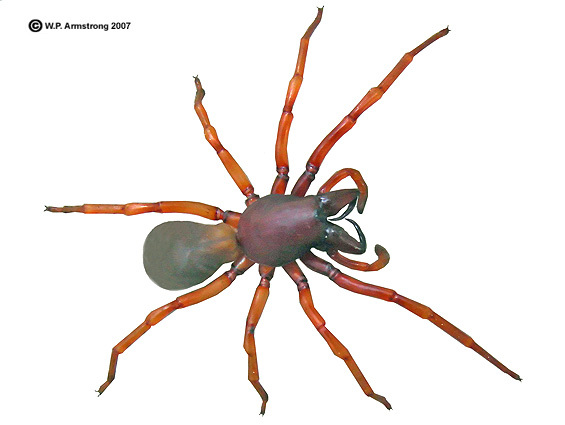 Scroll up to see this creature's mortal enemy, the "sow bug killer."